If you missed #42 click here. Best Moment: Definitely better as a multiplayer game, the first few levels are quite fun. 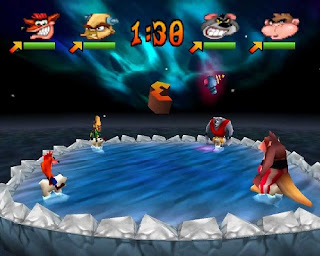 Crash Bash could have been great. It's a shame it wasn't. Why? Basically, it runs out of steam too quickly. This was the first Crash Bandicoot game that was done after Naughty Dog sold the game series. And it was a wise decision to work with a party game format, replicating the format that Mario had set. Super Mario Bros and Crash Bandicoot? Yup. Mario Kart and Crash Team Racing? Sorted. Mario Party and Crash Bash? Sure. But this game pales in comparison. When I say it runs out of steam too quickly, it's for a couple of reasons. Firstly, the game's story game layout is the same as the original Crash Bandicoot games, in the respect that to play new levels/party games you have to beat previous levels/party games. But what makes a party game fun is being able to play a variety of levels off the bat straight away, not being forced into playing what's in front of you in a linear format. And the second reason it runs out of steam too quickly is because the latter levels are poor compared to the first few levels. The first few levels of the game are actually lots of fun. But the last ones are difficult, frustrating and simply, not fun. And a party game needs to be fun. 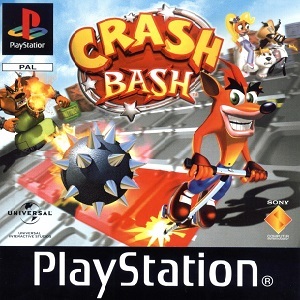 So, this game is simply not up to scratch, which is a shame, because I'd love to see Activision give the Crash Bandicoot party game experience another, erm, bash, because I do think it could be successful if they learn the lessons of Crash Bash. 10 down, 40 to go! Find out what came in at #40 by clicking here!